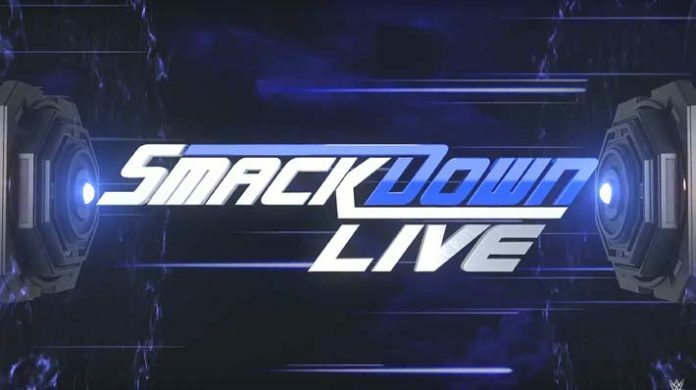 Tonight’s edition of WWE SmackDown Live took place from Greenville, South Carolina at the Bon Secours Wellness Arena. – Charlotte comes out first to kick off tonight’s show. Tom Phillips tells us from the broadcast table that AJ Styles is here tonight to address Samoa Joe one more time before their SummerSlam match on Sunday. Becky Lynch comes out to the ring to join Charlotte next, and then Women’s Champion Carmella comes out. Carmella gets on the mic and says the only thing worse than Paige making her defend her Title against them at SummerSlam, is Paige forcing her to come out tonight to talk face-to-face to Becky and Charlotte before their match on Sunday. Carmella tells Becky that the only thing she’s better than Charlotte at is being a clown, and Carmella has beaten Charlotte multiple times, so being Champion right now is good. Charlotte tells Carmella that her run is over, and her lying cheating and manipulating ends at SummerSlam. Charlotte says Carmella is a diva living in a women’s era. Carmella says her beauty, body, and charisma are all better than theirs, and she’s the Champ and they’re not. Paige comes out to interrupt and says why wait until Sunday, let’s see these women do what they do best. Paige says Carmella is best at talking, so she should go sit at the commentary table, while Charlotte and Becky will take on Mandy Rose and Sonya Deville in a tag match. – Charlotte & Becky Lynch vs. Mandy Rose & Sonya Deville: Charlotte starts off strong against Sonya and lays into her with a series of chops. Becky tags in and continues the offense on Sonya. Mandy tags in and then Charlotte tags in shortly after to double team her with Becky. Charlotte looks for a slam, but Mandy escapes and slams Charlotte down by the hair. Sonya tags in but walks into a fallaway slam by Charlotte. Becky tags and hits a splash on Sonya at ringside. Back in the ring, Becky covers Sonya for a two count then tags Charlotte back in. A distraction from Mandy leads to Sonya connecting with a body kick to Charlotte. Mandy tags in and they stomp a mud hole in Charlotte in the corner. Sonya tags back in to continue the offense on Flair. Mandy tags in without Charlotte noticing and hits a running knee to her face. Becky and Sonya get the tags, and Sonya takes control with a series of strikes. Mandy tags in and Becky fights her off with a series of clotheslines and a spinning heel kick. Becky hits a t-bone suplex, then Sonya runs in and Becky kicks her down. Becky applies the Disarm-her on Mandy shortly after for the win via submission. – Carmella gets up on the announcers’ table after the match and holds up her Title as Becky and Charlotte talk trash to her from the ring. – We see a pre-taped promo from The Miz and Maryse talking about The USA Network picking up their reality show for a second season. – Charlotte and Becky are backstage after their match, and Charlotte tells Becky she didn’t have to do it all by herself out there. They awkwardly exchange well wishes for SummerSlam and walk off. – The Bludgeon Brothers vs. The Triple Threat: The Triple Threat appears to be some local enhancement talent, and this will be a 3-on-2 match. The Brothers quickly clear the ring and hit the double powerbomb on one of their opponents. They follow the other two opponents out to ringside and put the boots to them. The Brothers slam two of the jobbers together, drop them on the floor, then Rowan slams Harper on top of them. Back in the ring, the Brothers hit the powerbomb Doomsday Device. – This one is a no-contest as the Bludgeon Brothers attacked before the opening bell. – The broadcast team sends us to a video package looking at the history between The Miz and Daniel Bryan. They show footage from Daniel Bryan’s time on NXT and his first interactions with The Miz, along with some new original interviews with both men talking about their feud. – Sanity vs. The New Day: This one is a six-man tag. Big E and Eric Young start things off, and Big E slams him down then dances. Eric fights back with series of elbows, but Big E shuts him down with a belly to belly suplex. Kofi tags in and leapfrogs over Big E for a leg drop on Young. Kofi tees off on Eric with kicks, but he misses one and Eric sends him down to the ringside floor. Wolfe tags in and beats down Kofi at ringside before taking him back in the ring. Dain tags in now and works over Kofi on the mat. Kofi tries to get a tag, but Dain shuts him down with a dropkick. Dain follows up with a fisherman’s suplex, then Wolfe tags in and hits a shot off the top. Dain comes back in but Kofi stuns him with a DDT and tags in Woods. Wolfe tags in and Woods drops him then clears the Sanity apron. Woods dropkicks Wolfe down then boots him in the head. Woods hits a tornado DDT and pins, but Eric Young comes flying off the top with an elbow to break it up. Young tags in now and fireman’s carries Woods onto Wolfe’s knees. Dain tags in and Woods fights back with chops to the chest, but Dain drops him with a cross body. Big E runs in to break it up, then he suplexes Eric Young. Wolfe runs in and goes at it with Kofi now. Kofi goes up top and hits a suicide dive onto Wolfe and Young at ringside. Big E tags in and they hit the Up Up Down Down on Dain for the three count. – After the match, The New Day celebrates their win and dances in the ring as we go to replays. – The broadcast team throws us to another video package on the history between The Miz and Daniel Bryan. This time we look at their respective successes in WWE, and then their incident on Talking Smack. – Paige knocks on Samoa Joe’s locker room backstage and Joe answers the door. Paige asks Joe why he has refused to address the WWE Universe like AJ Styles is tonight. Paige says she doesn’t want Joe to ruin her SummerSlam main event by attacking AJ tonight, and she asks Joe to be professional. Joe says he’ll make a promise right now, that he’ll keep doing whatever he wants when he wants, and AJ and the WWE Universe will have to deal with the consequences, or he could stay backstage and watch on a monitor. Joe says he’ll enjoy this night, and he walks back in his locker room. – Aiden English is in the ring with a mic. Aiden looks upset about costing Lana her match last week, and he starts singing about it. Rusev and Lana are shown backstage watching on a monitor. Aiden sings about letting down his friends, and he’s going to make Andrade pay tonight. – Aiden English vs. Andrade “Cien” Almas: Zelina Vega is at ringside in Andrade’s corner. Aiden starts off strong out of the gate, with a clothesline and a frogsplash off the top for a two count. Andrade stuns him with a back elbow and then drops him in the corner. Almas hits the running knees in the corner and then the hammerlock DDT for the three count after a very short match. – Zelina and Andrade cut a promo after the match trashing Lana, until Rusev and Lana come out to interrupt. Rusev comes out and says Andrade’s luck runs out this Sunday, and Zelina will learn why Lana is the best. Lana says together, they will crush Zelina and Andrade, because this year SummerSlam falls on Rusev Day. – AJ Styles is backstage with Paige, and Paige is pleading with AJ to stay professional tonight and not jeopardize their SummerSlam main event. AJ says he made his wife a promise, and intends on keeping it, then he walks off. – Jeff Hardy is backstage with his facepaint on and he’s staring into the camera. He’s getting ready to head to the gorilla position. – We go to the third and final video package about The Miz and Daniel Bryan for the night, which reviews Daniel Bryan’s return to the ring and the lead-up to their SummerSlam match. – Jeff Hardy vs. Shelton Benjamin: Shelton starts off strong and grounds Jeff with a chin lock. Jeff escapes and hits the Whisper In The Wind off the top for a two count. They trade blows in the middle of the ring until Jeff drops Shelton with a forearm shot. Jeff follows up with an atomic drop and leg drop, then a running dropkick to the grounded Shelton for a two count. Shelton goes for a kick but Jeff ducks and answers with a mule kick. Shelton tries to fight back, but Jeff catches him with an inverted DDT. Jeff goes up top, but Shelton runs up the turnbuckle and knees Hardy. Shelton follows up with a superplex and they both land hard. Shelton charges but Jeff stops him with a Sling Blade and then the Twist of Fate. Jeff covers for the three count. – As soon as Jeff gets to his feet, Shinsuke Nakamura comes down the ramp. Shelton tries to attack Jeff from behind, but Jeff drops him. Nakamura hits the ring and attacks Jeff from behind. Nakamura looks for the Kinshasa, but Jeff ducks it and hits the Twist of Fate. Jeff runs up to the top rope and follows up with a Swanton Bomb on Nakamura. The camera cuts to the back and we see Randy Orton lurking behind a curtain near the stage staring at Jeff in the ring. – The broadcast team runs down the SummerSlam card again and promotes the WWE Network. – WWE Champion AJ Styles makes his way down to the ring next. The crowd chants his name as AJ gets on the mic and talks about being in the business for 20 years competing against the best talent around. AJ says the most important lesson he learned was after he won the WWE Championship. He says there is a lot of pressure on you when you win the WWE Championship. He says Joe knows how to hit his pressure points, and then talks about Joe attacking him from behind. AJ says Joe wanted him to lose his cool and he did. AJ talks about remaining focused and his wife asking him not to lose his cool again, and then Samoa Joe comes out to interrupt. Joe comes out to the stage and has a piece of paper in his hand. Joe says what AJ says is just not true, and he holds a letter in his hand from a member of the WWE Universe, and he thinks AJ should hear it. Joe reads the letter, which is from a fan saying Joe’s remarks about AJ and his family made him feel ill, because they were true. Joe continues reading from the “fan” letter, which says AJ seems like he’ll do anything to stay away from his family, and maybe he never wanted kids or a wife, and then Joe says the letter was written by “Wendy Styles.” Joe walks off as AJ looks confused and SmackDown goes off the air.